The CPE range of electric hoists offered are perfect for professional lifting operations with high efficiency, easy servicing and a long working life. 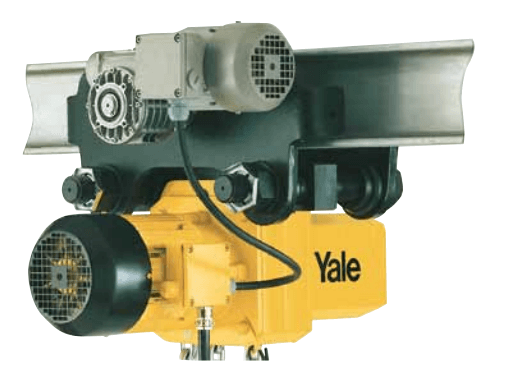 The Yale CPE electric hoist is available in single speed – the CPE, and dual speed – the CPE/F. 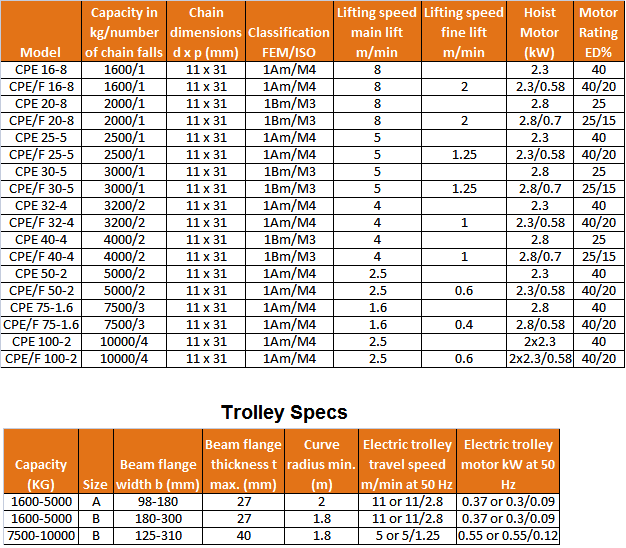 The additional benefit of an optional integrated powered trolley is available if required. 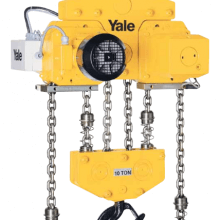 Also available is a twin hoist model – the CPE 100-2 for extra heavy duty lifting operations. 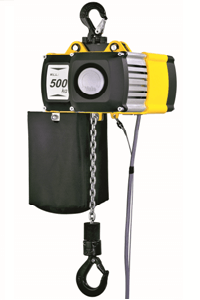 The CPE range of electric hoists offered by Lifting Hoists Direct are perfect for professional lifting operations. High efficiency, easy and inexpensive servicing and designed for a long working life are the main plus points. The CPE range has a large number of specialised features to provide an electric hoist with optimum power, safety and efficiency. The motor classification varies between the models. The Yale CPE (/F) 20-8, 30-5 & 40-4 models being classified at 1Bm/m3 and all other models at 1Am/M4; it is possible to modify classification rates on request. The highly efficient, robust squirrel caged motor has an adjustable spring pressure brake. This continuously holds the load if the power fails. This hoist has also been fitted with bimetallic thermal protection to minimise overheating. 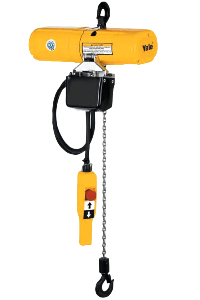 The motors on these hoists have an IP54 rating which protects against contact with live or moving parts within the enclosure. Also against solid foreign particles over 1mm and splashing in all directions. It also has a class F insulation rating, and ideal for operating temperatures from -10 to +50 degrees. The planetary gearbox has an oil bath for lifetime lubrication. It also gives extremely smooth operation. There is a 5 pocket sheave for the load chain which is made from case hardened steel. 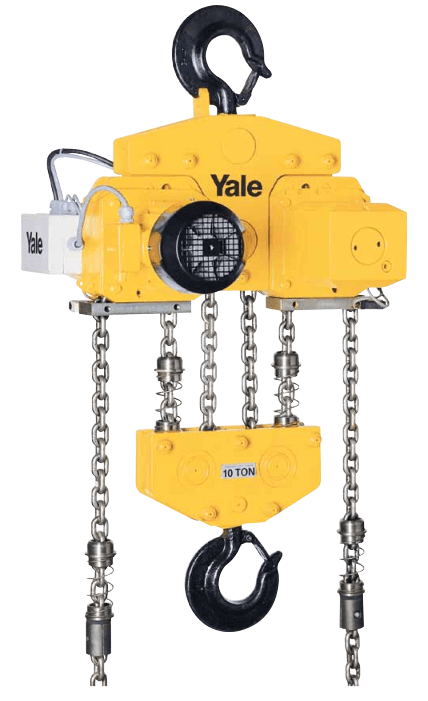 It it is perfectly matched to the zinc plated load chain which ensures smooth and precise chain movement. Available with direct control or 42v low voltage control, the pendant controller is fully encapsulated and protected to IP65. This rating gives complete protection against contact, dirt ingress and water jets in all directions. 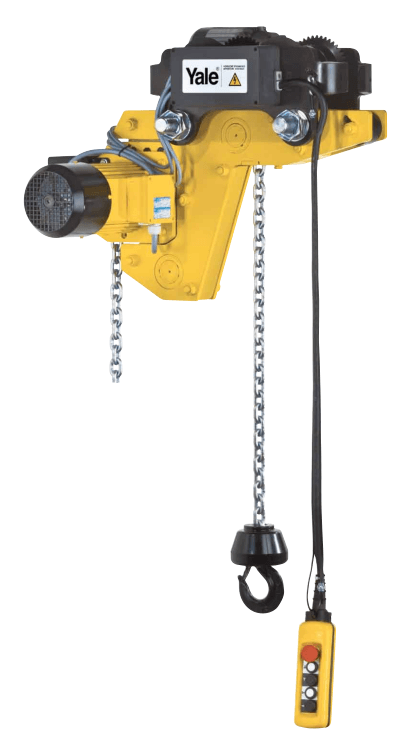 The duty cycle for these electric hoists is 40% at one operating speed. The standard operating voltage is euro-voltage 400v, 3phase, 50Hz. Both the top suspension hook and the load hook are manufactured from non-ageing, high tensile steel and come fitted with robust safety catches for extra security. 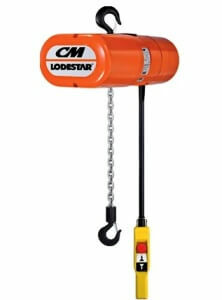 The largest CPE hoist is the CPE/F 100-2 which is a twin hoist version. 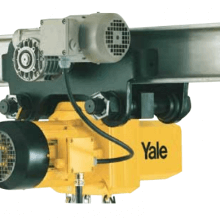 This special hoist is essentially made up from two CPE 50-2 hoists which are connected by a custom framework. 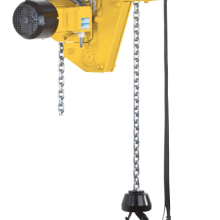 These hoists can have many advantages to heavy duty lifting applications and give a huge lifting capacity of 10000kg. High and low limit switches come as standard on this model only. 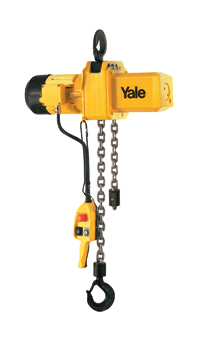 The Yale CPE hoist has a number of extra options available to further enhance the hoist and user experience. If you need more information give our sales team a call on 01384 76961 or use the contact us form here.